Hey Portland and surrounding areas, very funny person (and A.V. 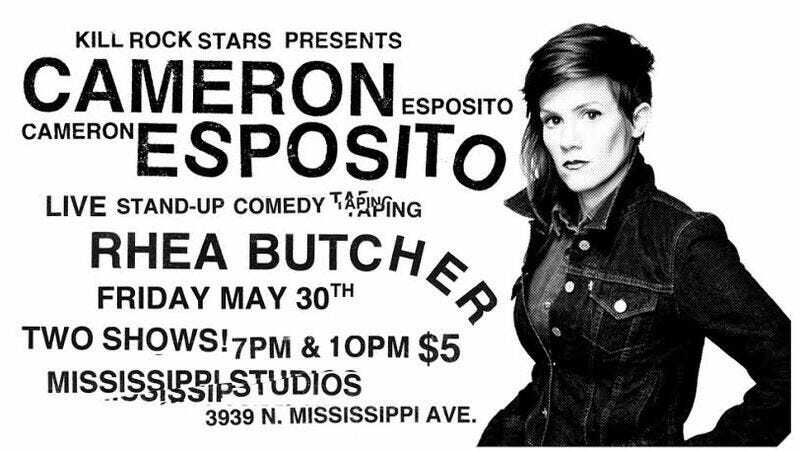 Club columnist) Cameron Esposito will be recording a stand-up special in your town on May 30, and we’ve got a pair of tickets to give away. The show (shows, actually) will take place at Mississippi Studios, with performances at 7 and 10 p.m., and they’ll be recorded for release on the venerated Kill Rock Stars label. If you’d like a chance to hear your own unique-as-a-snowflake clapping style on a real live comedy album, just send us an e-mail here, stating your preference for the 7 or 10 p.m. show. You must be 21 or older to attend, so please be that before you send us that e-mail. We’ve got two pairs of tickets to give away. Denim!